It can feel insulting when someone tells you to accept your anxiety, depression or other mental health symptoms. Especially if they appear to be an academic expert who does not have the intense lived experience of an anxiety or a mood disorder. They haven’t awoken with primal terror as if their heart is trying to beat its way out of their chest. They haven’t carried the weighted vest of depression, barely being able to move, think or eat. They haven’t spent days circulating back and forth between panic, obsession, depression and depersonalization, barely able to function. They are not like us. However, there clearly are many experts who have experienced this. Marsha Linehan, the pioneering therapist, is a great example of an expert with this severe lived experience. She later went on to develop Dialectical Behaviour Therapy, intending it to be a life raft for the most acutely suicidal patients. Steven Hayes is another; he developed Acceptance and Commitment Therapy (ACT) to help him overcome his panic disorder. Also within the ACT world Russ Harris also experienced depression, his search for meaning ultimately led him to ACT. And Prof Paul Gilbert had his own period of depression and anxiety in the late 1970s. They all used acceptance and compassion to get them out of the quicksand of these emotional pains. But it can be a challenge when someone without this life experience advises you to ‘just accept’ it. How could you possibly accept this heavy, thick, depressive pain or crippling anxiety? It might feel better when people talk about tolerance. This doesn’t mean you have to like your emotional pain, just as to tolerate a headache doesn’t mean you enjoy the physical pain. Emotion regulation scientists talk about two key techniques: cognitive reappraisal and distraction. They argue that these are healthier tools to tolerate rather than suppress your emotional pain. And they certainly do not suggest you should become best friends with your symptoms. And then there is the compassionate stance. Here we validate our pain, perhaps reflecting on our shared humanity with others and draw upon a compassionate motivation to take care of ourselves-Acknowledging the pain but with a commitment to alleviate it. 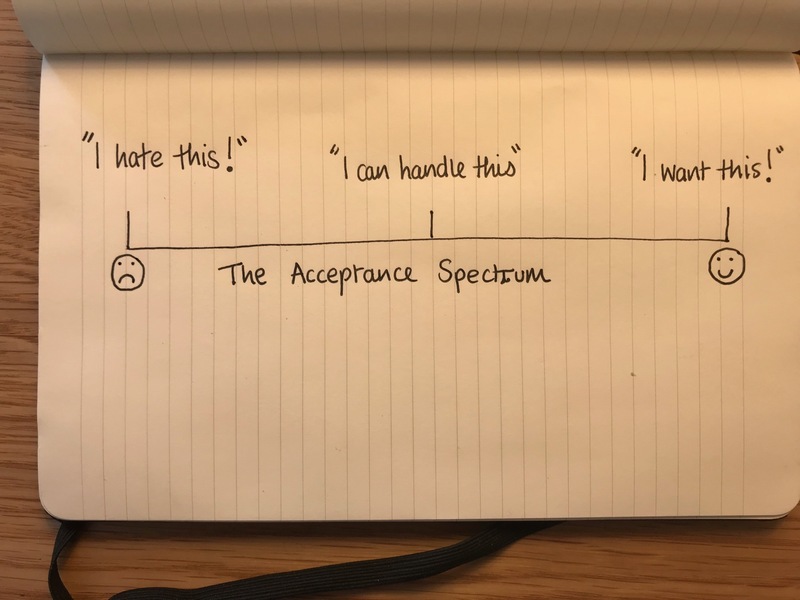 Personally, I have started to look at acceptance as a spectrum. At one end our distress is not welco me and we will try anything we can to get rid of it. At the other end, the pain and distress are welcome to stay as long as they want. We will continue living our lives with them by our sides. We can work our way up to this end of the spectrum and we can help ourselves in whatever way is kind, to build tolerance and push deeper into a state of acceptance. We can focus more on deepening our ability to function with these painful states present, rather than constantly monitoring whether or not they have gone. I really like Mark Freeman’s analogy of these painful emotions being like the pain and exhaustion we feel when doing physical exercise. When we first start going to the gym, cycling or swimming then the pain, aches, stiffness and exhaustion can be enough to make many of us run to the nearest pub for an ice-cold pint! However, if we can stick through this we can even get to a point when we enjoy the burn, the discomfort becomes a sign of progress, fitness and growth. The same can be true for painful emotions. Reid Wilson , in the brilliant ‘Don’t Panic’ talks about different levels of working with anxiety. 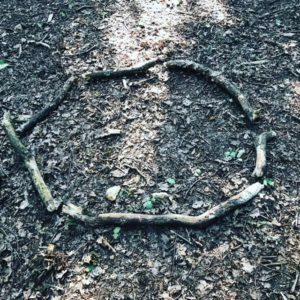 We start with resisting, saying ‘I don’t want this’, and we gradually move to being more comfortable with the emotion saying ‘I can handle this’. 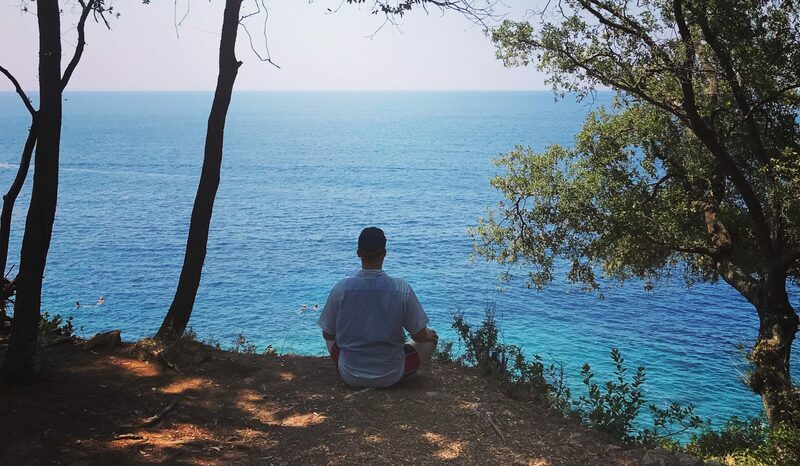 At this stage we can use tools like breathing, relaxing, attentional control or kind self-talk to help us be more willing to be with the anxiety as we turn our attention back to the present. 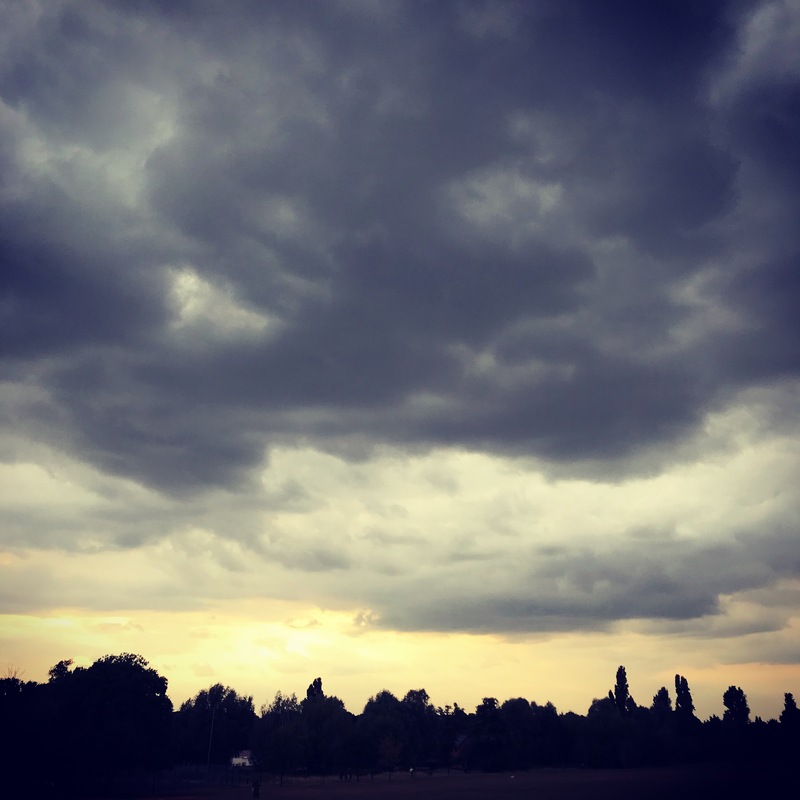 But then we can move to a level of wanting more discomfort and uncertainty and even saying to our panic ‘I want it to be strong, I want it to last, make this sensation stronger’ and then turning our attention back to our valued direction. This brilliantly highlights the acceptance spectrum. It shows the tools we can use to get closer to feeling these emotions and having these thoughts whilst following our values and living our lives. We show our brains they don’t need to sound the alarm. It’s always worth reinforcing that this type of acceptance does not refer to accepting oppressive external conditions, social injustices, bad relationships or other environmental factors of inequality. It means accepting the aspects we can’t change such as an emotional thermostat set to be on the sensitive side. We can work with others to try to change oppressive external conditions. But for our internal environment we can gradually widen our window of tolerance and lean into our acceptance spectrum. So how can we work our way along the acceptance spectrum? Stay focused on our goals which express our values. Studies have shown that affirmation of your values can even reduce the release of the stress hormone cortisol in stress tests. Use kind gentle self-talk in the form of coping statements. Not to get rid of our pain, as that is a futile endeavour, but rather to accept and move into life with our pain at our side. Endurance athletes, emergency services and many more know the power of self-talk to cope with adversity. Create an exposure hierarchy and gradually progress from less challenging experiences to your more difficult ones, trying to get a sense of ‘I can handle this, I will continue toward my valued directions in life’. Allow time. Practicing leaning into life and allowing time to pass will build up our acceptance. We see this in our wise elders, often they manifest high levels of acceptance. We will all likely move up and down the spectrum on different days and periods of our life. We will have lapses and perhaps even relapses when it feels we’ve lost our ability to accept and continue on. Our level of acceptance might be higher for some emotions or thoughts than others. But we can all work at developing this ability whilst we enjoy moving through life with the people we love. Let me know how you experience your acceptance spectrum, I’d love to hear any thoughts you have on this in the form below?